Rucci Law Group sponsored the screening of “The Buddy System: A Dog Makes A Difference” at the Darien Library in December of last year. The movie is an award-winning documentary film depicting the deep bond between trained assistance dogs and children on the autism spectrum, presented by STAR Inc. and the Darien Library. STAR, Inc., Lighting the Way is a not–for-profit organization serving individuals of all ages who have intellectual and developmental disabilities, as well as providing support services to their families. 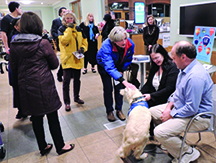 “Buddy”, the companion dog, greets guests at the movie screening at the Darien Library.